The idea for this last MISTical March page came from an Art Journal page by Kim Beinschroth. 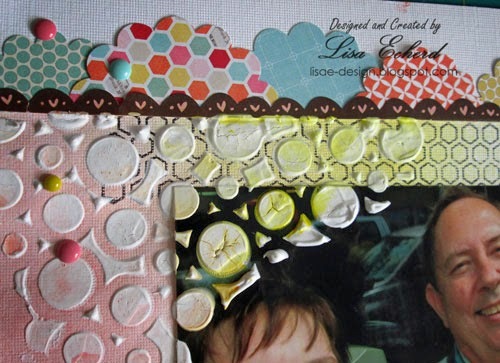 On her page she used gesso and mist around a magazine clipping. I used these on my photo. It seems a little scary to spread modeling paste and gesso over your photo. However, this definitely isn't the best photo of me. It is a fun selfie taken last summer when we were splurging on ice cream from Kilwins. 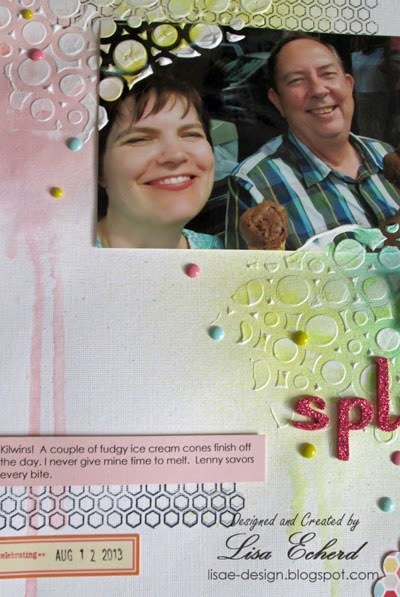 We are both chocolate lovers but I used sherbet colors for the page and drips to continue the ice cream theme. Now, our ice cream never gets a chance to drip! Here are a few closeups of the page. I had no 'e' letters left so I rearrange a "z." Foam Thickers make that a lot easier. Thanks for visiting and watching! I'm always on the lookout for what you want to see. It is fun to explore ideas and find topics that interest everyone. So if you have an idea for techniques you'd like to see a perspective on, let me know. I love this layout, Lisa and the dripping mist is perfect! Loved this layout and the whole misting series! The drips of mist were the perfect touch on this ice cream page. Ooo, love this so much, Lisa! So, so cool! I LOVE the gesso! Looks amazing, Lisa. Fabulous page. This is a fun photo and I love the embossing paste and colours. Perfect!